Nine years ago, I went to Germany with my high school choir and visited the fairytale-ridden city of Heidelberg which borders the black forest. While there, I visited a castle and book shop where I purchased a book called Sissi: The Tragic Empress, The Story of Elisabeth of Austria. Immediately, I was hooked. 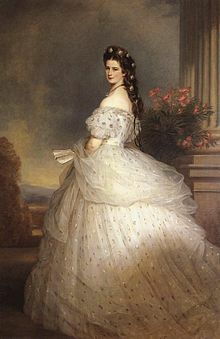 Princess Sissi (or “Sisi”), the wife of Franz Joseph I was a conformist with free spirit who loved horseback riding, exercising, and her 19 inch waist. 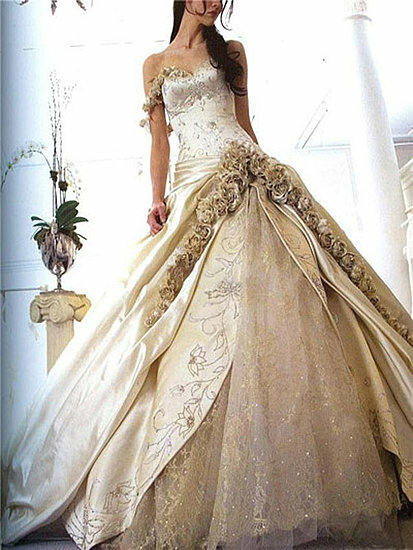 Her hubby was actually her maternal first cousin who was actually meant for her older sister, Helene. Upon meeting the sisters, he was immediately infatuated with Sissi and they were engaged 5 days later with wedding following 8 months hence. She was only 16. Sissi had a horrid mother-in-law, Princess Sophie of Bavaria, who micromanaged her constantly and took her first two children (girls) from her, without even allowing her to breastfeed. She even named the elder daughter after herself without consulting Sissi. On the first trip to her beloved Hungary, her second daughter, Gisela, died. Sissi later had two more children, the first of which was a son who at the age of 32 was found dead beside his 16 year old lover; it was considered a murder-suicide although no one really knows the true details. Her youngest child, Marie-Valerie, was finally able to be raised with her mother and, unfortunately became the recipient of all Sissi’s previously dormant maternal feelings. After the tumultuous court life, adulterous rumours about her husband, the haunting of her mother-in-law/aunt, deprivation of children, multiple health issues, and the death of several close family members, Sissi suffered her last and biggest blow. While visiting Geneva, Switzerland incognito, she was assassinated by a Luigi Lucheni, a 25 year old Italian anarchist. The young man pretended to bump into and conveniently stabbed her with a 4 inch file. Sissi, unaware that she’d been stabbed (probably because of her corset) walked 100 feet to board a boat and collapsed and lost consciousness once she’d gotten there. The boat was turned around and once taken back to their hotel, it was discovered that she was now dead. Upon performing an autopsy, the file was found and the cause of death determined. It was later revealed that Lucheni came to kill a different sovereign who’d left Geneva. So he decided to kill Sissi instead. “It was a crown [he] had in view”. Needless to say, Empress Sissi’s life was well worth recording and emulating which many people have done since. 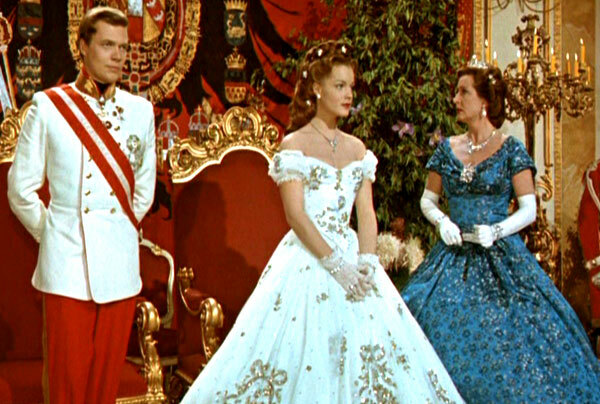 But probably the biggest thing from Sissi’s life to be replicated was her famous white ballgown covered in gold stars with diamond star hair accessories. 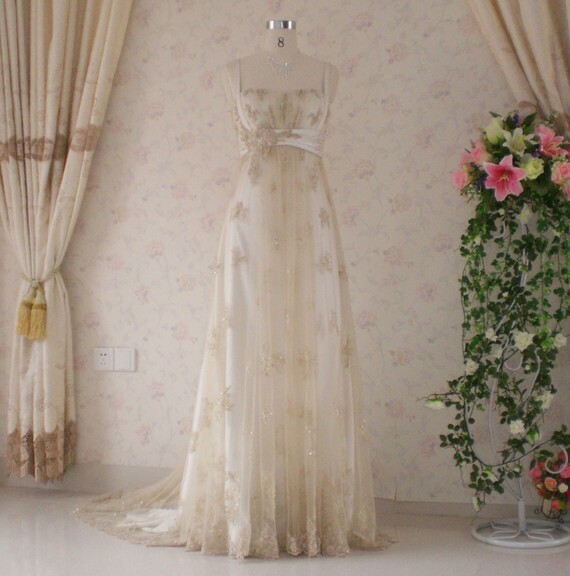 It makes the perfect wedding dress. Actress Romy Schneider portrayed the empress in 1956 film Sissi, the Young Empress and wore “the gown”. 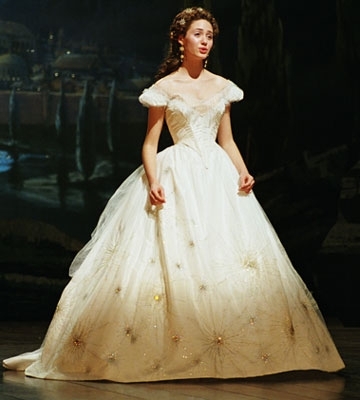 A more recent replication is of Emmy Rossum’s character Christine Daae in The Phantom of the Opera film wearing the same starry gown and hair pins. 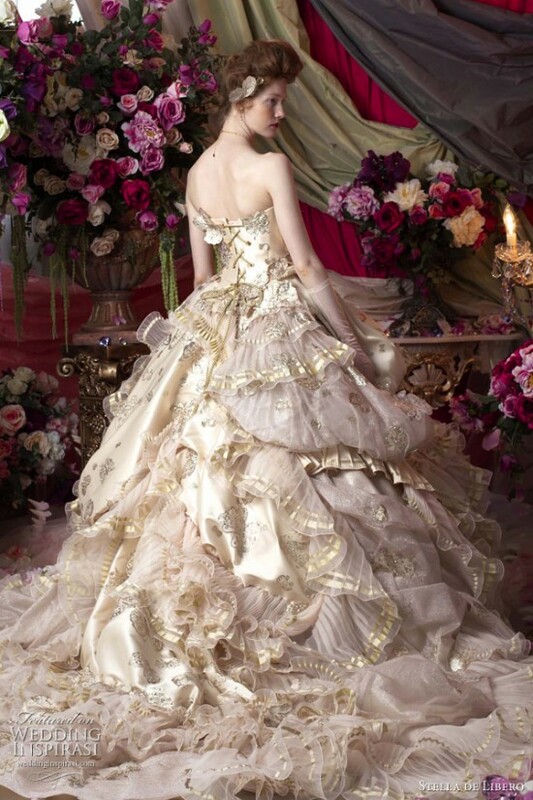 I’ve found some wedding dresses that “channel” Sissi, I hope you enjoy them!